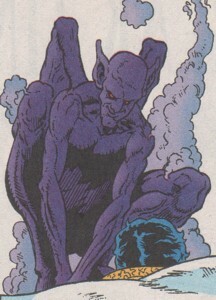 Powers/Abilities: He had the ability to rise as smoke from the nostrils and eyes of sleeping people into the real world. He regained his bodily form after this process and smothered the sleeping people by sitting on their chest. (OvEd#7 (fb) ): The Hanon Tramp became an agent of Sherwood and killed three guys who went out with Sherwood's former girlfriend Sally Slavinski. (OvEd#7): Robert Mitchell, Sally's newest date, lay in his bed and had a terrible nightmare. Suddenly smoke rose from his nostrils and eyes and the Hanon Tramp appeared. He sat on the chest of Robert and squeezed the air out of him, but Robert didn't wake up. Robert's unconscious body gasped, unable to breathe, until he was dead. The Hanon Tramp returned to Nightmare's realm afterwards. He soon met Sherwood again in the realm and this time he was ordered to kill Dr. Strange. He parted ways with Sherwood when both saw Dr. Strange and Nightmare coming for them. The Hanon Tramp rose as smoke from the eyes and nostrils of Dr. Strange into the real world and tried to smother him, but Nightmare appeared and scared him away. Hanon Tramps were a race of demons in the Realm of Nightmare. The other members of this race most likely had the same abilities as the Hanon Tramp shown in this story. The Hanon Tramp is nothing new at all as the name was originally used by Germans to describe a kind of nightmare wherein a demon was suffocating a person in his sleep by sitting on his/her chest. The creature in this story does the same. This thing really is a mythological creature. Though I know where this demon was first used under the name Hanon Tramp, I don't know when. I know that the name is Hebrew and I first thought that the Germans used it for anti-Semitic reasons, but I don't know it for sure. It could also be that originally Jewish citizens in Germany invented the Hanon Tramp and others just reused it. If these demons weren't part of the Realm of Nightmare on Earth 616 I would say that they were children of Lilith because she used similar tactics to kill people (especially infants) in Jewish (mostly Kabbalistic) mythology. He was the former boyfriend of Sally Slavinski. He was into the occult the big way and was left by Sally because she was scared of him. He didn't take this too kindly and started to stalk her. He found a way to enter the Realm of Nightmare in one of his books and made a Hanon Tramp his personal assassin which he sent after the guys who dated Sally. He followed her all the time and after the fourth guy died he followed Sally to the Sanctum Sanctorum of Dr. Strange. He went home and took some sleeping pills to get into the Realm of Nightmare again. There he met the Hanon Tramp and told him to kill Dr. Strange. He parted ways with the Hanon Tramp when he saw Dr. Strange and Nightmare coming after them. Sherwood entered the dream of Sally and Strange followed him. From there Sherwood went into the real world in his astral form and showed Dr. Strange that Nightmare was in the Sanctum Sanctorum. Sherwood used the short distraction to directly enter Sally's lungs. He tried to kill her the same way the Hanon Tramp killed her dates, but Dr. Strange flew in his astral form to Sherwood's apartment and woke him up before he could kill Sally. He also erased all spells from Sherwood's magic books which Sherwood angrily found out when he opened one a few seconds later. From now on he tried to stay awake by taking pills, but one night he fell asleep and returned to the Realm of Nightmare where the master of the realm already awaited to administer punishment. She was the former girlfriend of Sherwood. She learned many things about magic from Sherwood, but in the end she left him because he was blabbering about magic all the time and she was scared. She tried to continue her life, but after four of her dates died in their sleep she went to Dr. Strange for help. She told him her suspicion that Sherwood was murdering her dates and gave Strange his address. She met Sherwood again in her dreams and he returned through her dream-self's eye into the real world where Sally was still asleep. Sherwood entered her lungs and tried to kill her, but Strange saved her. Sally now continued her life without fear and soon found another guy to date.